I would like to thank Bella Barista for the loan of a brand new E61 group to take apart and generally abuse in the interests of people who own machines with this type of group. I have taken the time to specify what I believe should be in an E61 group service kit and Bella Barista have taken the trouble to order these parts and make them up into kits. It was a lot of work to do this and it is not really very profitable for them to stock these kits, but I persuaded them to do this as a service to their customers. your E61 group uses the same compounds in it's seals that make up the group head gasket. we all know how this hardens and perishes with time. 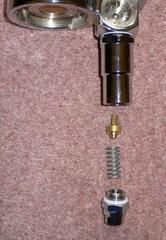 This also happens to the components within the group head. in addition springs become weaker and the whole system generally stops working as well as it should. depending on how much you use your machine and how many hours per day you have it switched on, you could expect to need to replace items any time from 2-3 years onwards. Cam Lever gaskets can for example start to leak after a few years (these are detailed in the article, as they can be replaced without major group disassembly). Other gaskets within the E61 group may last longer (they will be hard and cracked, but may not be leaking excessively)….be assured though, at some point your group will need a service. This simplicity is a huge bonus when it comes to maintenance and repairs, because as with anything on espresso machines, parts within the E61 group do age and need replacement over time. 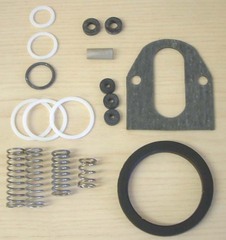 These parts are things like springs, washers and seals, o-rings etc. The springs “tire” over time, they are under tension, they get hot and cold. The seals and little gaskets harden with time; just think how fast your group head gasket hardens…what do you think these seals are made of? Luckily replacement of everything within the E61 group is actually simplicity itself and you do not even have to remove the group from the machine if you don’t want to. We start by removing the handle, because one of the most common service jobs on the E61 group is the replacement of the two cam lever arm gaskets, when it starts leaking from the lever under pressure (more than a few drops). A simple screwdriver is all that is required to do this job. 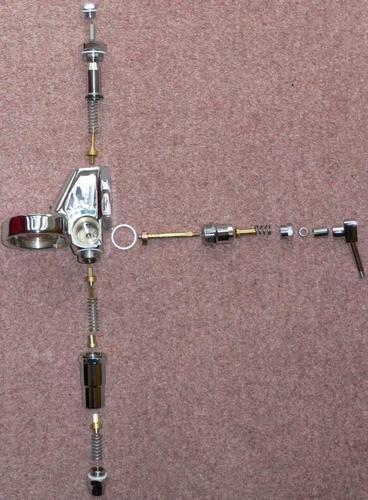 OK out comes the rest of the mechanism, first the outer then the inner parts. Here you can clearly see the gaskets and these need to be removed with a dental pick, they simply pull out and the 2 new ones push in (they are fitted in pairs). 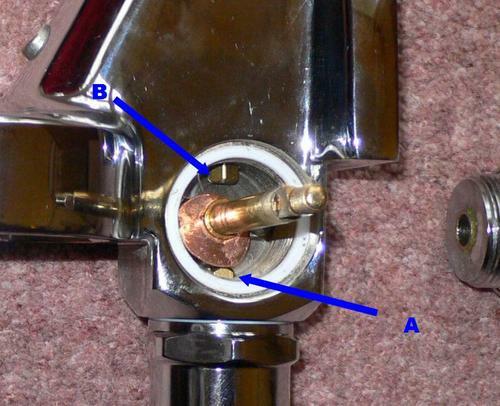 Refit the cam (in the neutral position (neither A or B under pressure) and whilst holding it under a little pressure, use the lever to move it to the fully “vented” position (A depressed as in picture). 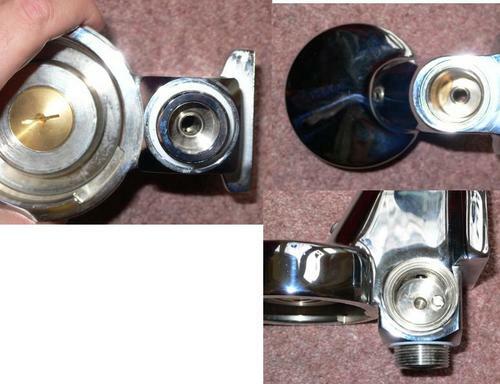 The reassemble the bottom fitting in the picture below. 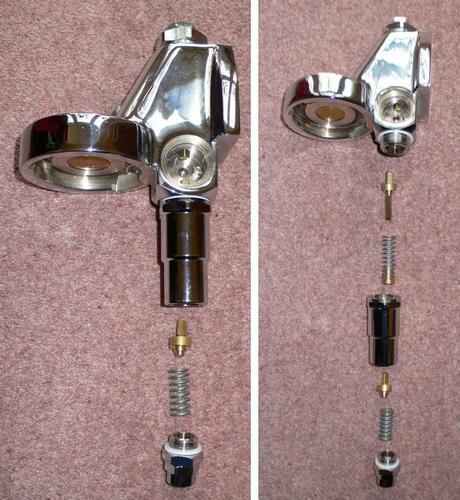 allows pin A to move freely and when the lower assembly is refitted, it self centres. You may just be able to see the food grade lubricant on the cam in the picture, of course yours will be dry, so if you have some food grade lubricant you can use it on reassembly. This also seems a good time to explain how the cam works. 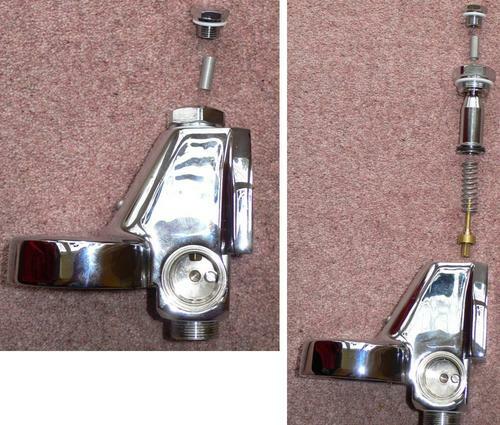 It is of course attached to the lever arm and when lifted to “pull a shot”, presses pin B and at the same time a switch on the front panel (again depressed by the lever arm) switches on the pump. Pin B is attached to a spring and seal mechanism (which you will see later) and allows water to flow from the Heat Exchanger (HX) or Brew Boiler into the group. Later when you have "pulled your shot", depressing the lever presses in pin A, which allows the group to depressurize. the water flooding past pin A and out through the bottom vent. Note: Pin A being depressed also opens another valve at the bottom of the preinfusion chamber allowing the water to vent out. 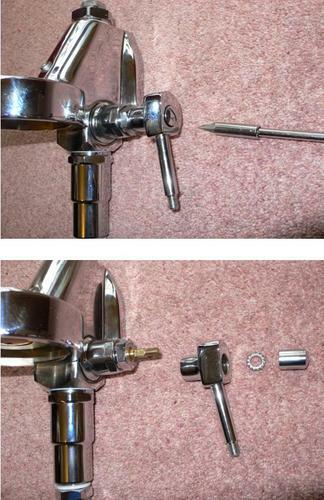 Simply done by using the wrench to remove the two tubes (with fixed nut shapes), starting with the lower one first. 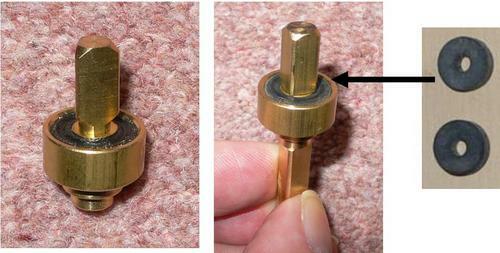 The two little brass plungers you see contain the seals shown below. These harden and leak over time and are moderately difficult to replace. Now I did say moderately difficult so a little more detail about how to do this. You grip the round part containing the seal (marked with the BLUE arrow) with the water pump pliers, which can be adjusted to nicely grip round objects. “IMPORTANT” you grip the triangular part (marked with a RED arrow) by adjusting the jaws, with the plastic jaw covers of the wide mouth wrench. It does not matter if you scratch the part marked with the blue arrow, but you want to avoid scratching the part with the red arrow. 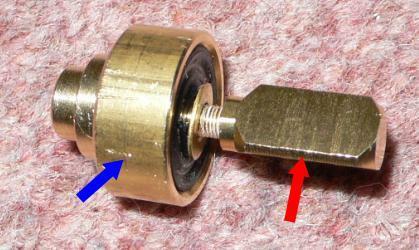 The part with the RED arrow needs to slide within the group, metal on metal and so needs to be kept smooth, the part with the BLUE arrow doesn’t slide against anything. Also any marks on this can be smoothed over with fine emery paper if you really want to. Now you can see the damm threadlock used, which makes it quite difficult to unscrew, but if your careful it will come off OK, then simply dig the old seals out with a dental pick and push the new ones into place, then reassemble. Of course you don't need to bother with threadlock, in fact I would advise against using any. 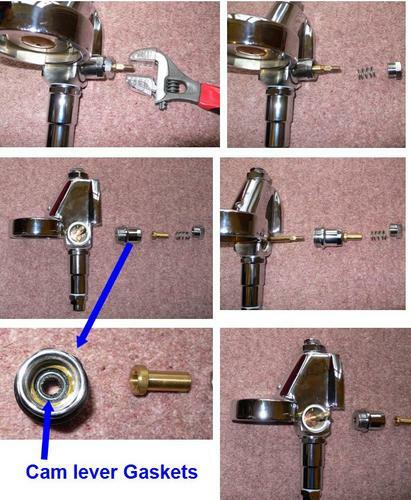 I will ask Bella Barista to also order a few sets of the various plunger assemblies, in case a few people snap off the fitting trying to unscrew it! Again it contains a single little brass sealing plunger like the bottom part of the group and the seals are exactly the same size. If this seal fails, it causes water to keep dribbling out of the group until the HX unit is drained (or in the case of a non HX until the brew boiler has emptied past a certain point, not good news). In case you got lost along the way, your E61 group should now look something like this. Now there are lots of little white Teflon seals that I have not mentioned, but of course they are easy to see and replace. If they leak, replace them, but I have found (contrary to advice I was given) that they are quite reusable in practise, if you don't tighten things too hard. A few views of the E61 group, which is pretty much now just a hunk of chromed brass…but in case you wanted to see what’s left. Putting the group together again is really quite easy and only takes a few minutes. 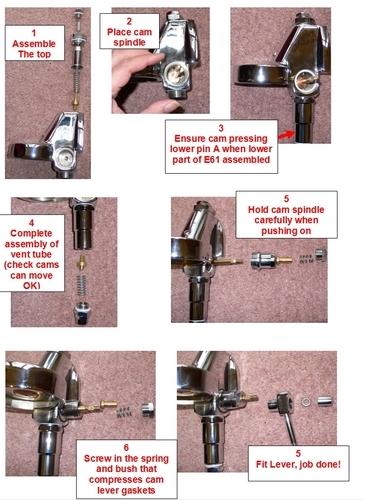 The reason for this is because, the assembly can jam, this will prevent proper operation of the cam lever because pin A could have “jammed” it will also cause scratches on the cam if you try and move the lever against the “jammed pin”. Tightening up the lower assembly first ensures pin A will move freely and when the lower assembly is refitted, everything self centres. You can then observe the pins and cam as you move the lever to check it all moves nicely and smoothly. Some poetic licence used here, as I was reusing some photos (don't forget, click to enlarge). The tools needed to do this job are quite simple an ordinary screwdriver set and a special wide jaw wrench shown below, about £8 from e-bay. You need this type of wrench because some of the nuts are really big and the wrench below is compact enough to fit these nuts but still allow you to work on the group whilst it is installed in the machine. Note the plastic covered jaws, very important! dliefbroer wrote: Dave what kind of lubricant should I use for the cam? Any dutch names/brands by any chance? 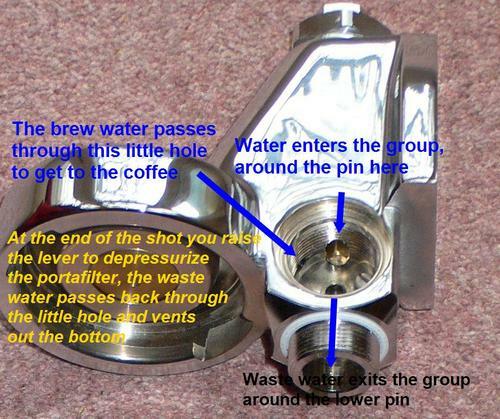 When you do take everything apart, soak all the internal components with a puly cafe boiling water solution…. Check the springs out and if your existing springs seem OK (only if your sure they are! ), then you could keep them (see how elastic they are and compare the lengths to see if they are "compressed"). This way you have the new springs for next time and can perhaps simply buy the cheaper mini viton seals and teflon gaskets. either way, don't throw your old springs away….you never know, they could come in useful if one breaks, or to help a friend out in an emergency.